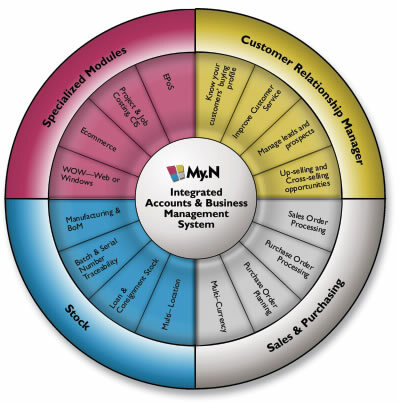 My.N from Accounting Office is a fully integrated business management and accounting software system makes it easy and natural for information arising from your everyday processes to be filed, stored and referenced in your central database. As we all know, people are happiest using applications they are familiar with. Therefore, we have extended the integration of My.N business management and accounting software out to Microsoft Outlook, Word and Excel. This allows you to store any incoming or outgoing mail, along with attachments, in your back-office database. Documents may be generated automatically from templates to produce quotes, price lists or general correspondence. These may then be logged, stored or retrieved by any staff member with the relevant access rights. This can be from any PC connected to the network, or while working remotely through the system’s Web Browser interface.